Driving Dynamics, a provider of advanced performance driver safety training and risk management services for fleet-based organizations throughout North America, has been named among the 2017 Top 20 health and safety training companies by Training Industry Inc.
"This validates our commitment to providing fleet safety training and risk management services that meet the highest standards in our industry,” said Tony Vinciguerra, Driving Dynamics COO. 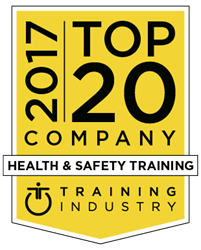 Driving Dynamics Inc., announced today it has been selected as a 2017 Top 20 Health and Safety Training Company by Training Industry Inc. as part of its mission to continually monitor the training marketplace for the best providers of training services and technologies. “Driving Dynamics is very honored to receive this recognition. As we celebrate 30 years in business, this acknowledgement of our leadership, along with other distinguished awards we have received so far this year, validates our long-term commitment to providing fleet safety training and risk management services that meet the highest standards in our industry. It also validates our ongoing efforts to enhance existing services, develop new instructionally sound training programs and expand our geographical footprint,” said Tony Vinciguerra, Driving Dynamics COO. Training Industry spotlights the latest news, articles, case studies and best practices within the training industry and publishes annual Top 20 and Watch List reports covering many sectors of interest to the corporate training function. Their focus is on helping dedicated businesses and training professionals get the information, insight and tools needed to more effectively manage the business of learning. Founded in 1987 and headquartered in Newark, Delaware, Driving Dynamics has earned its position as an accomplished provider of impactful driver safety training by continually building and delivering programs based on sound research, proven learning methodologies, and expert instruction. The company is dedicated to improving drivers’ abilities to stay safe by leveraging risk management tools, principle-based learning, and applied techniques. Driving Dynamics encourages all drivers to Steer Toward Safety™. For more information visit http://www.drivingdynamics.com.